There is some really high quality software available for free these days, in almost every category – software that is powerful, easy to use, and highly effective. The problem is that on almost every site where it is available for download, the site intentionally makes it difficult to find the correct download link. The people who run the site do this because they get paid by companies to confuse you so that you will click on a link that takes you to a piece of software they WANT you to download. Here are a couple of examples from CNET and Filehippo, two very popular freeware download sites. I’m going to let you in on one of the best-kept secrets in the techie world. There is one site which has brought some welcome sanity into the process of downloading high-quality free software. It is called ninite.com. 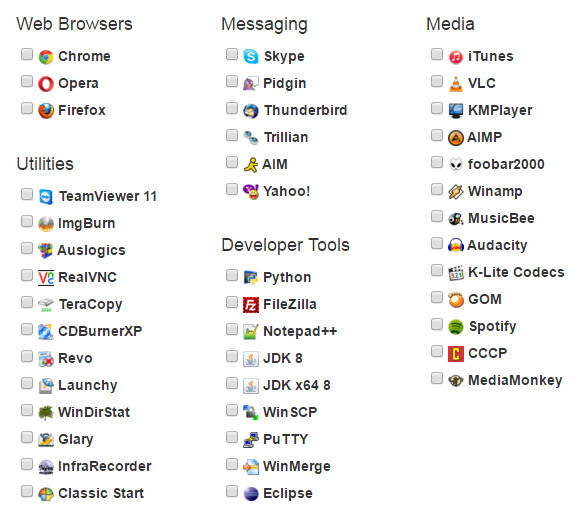 At ninite.com, you are presented with a list of free programs, organized by category. You simply click in the box next to each free program you want, download a lightweight installer, and run it. All of the programs you selected will be installed automatically. The installer will detect the version of Windows that you have, whether it is 32-bit or 64-bit, and will install the latest version of each program you selected, automatically choosing the install options that protect your privacy and provide you the maximum functionality. No tricky stuff, no confusing choices, no intentional deception. Just a fast, straightforward unattended installation of the programs you select. And if you already have some of the programs listed on the ninite.com site, you can select those programs and ninite.com will automatically update them to the latest version. Here’s one – and only one – word of caution. Don’t assume that just because a program is free or available on a site like ninite.com that you will like it, or that it will accomplish all you need or want it to. Do your research before you download any software, and make sure that it’s what you’re looking for. Ninite.com just gives you a safe and efficient download and installation process; it does not guarantee that you will like or benefit from the software. So how do you find a good program that will do what you need? One excellent place to look is Gizmo’s Freeware. Their “Editor’s Choice” and runner up programs in each category are often the best available. You can find the Editor’s Choice programs listed on this page. Free antivirus, free office suites, free graphics editors, free utilities – these and many more are all yours for the taking. So download and enjoy! Hi Randy – Are you familiar with Apple products – I ask because I have a MacBook Air laptop that I use. I’m looking for a reliable free download or “Word” or a comparable “Office Suite” program for a Mac User. Do you happen to know of a site I may find something like this ? Thanks a greetings to Rosie from us!!! Hi, Judy! Thanks for poking around on my site. I’m not a Mac guy — strictly PC, but I do know that the most frequently recommended Office alternatives across all platforms, including Mac, are LibreOffice and OpenOffice. Google is your friend as far as where to download those. Additional options are covered in this article. Blessings to you guys! Is Free Software Really Free – Make Sure You’re Not Surrendering Your Privacy!